It was Pon Pon’s first birthday (insert happy dance here!) and we celebrated this special day with our family over the weekend. We wanted to invite a bunch of our friends but we settled on having a small, intimate gathering at our apartment instead. We figured she won’t remember a thing now and it’s best to keep our sanity (planning a party is hard work!) and save a few bucks until she starts asking for it in coming years. Because we hosted a party here at our home and cooked our own food (except for birthday cakes), we were able to keep the cost somewhat low (and it was relatively stress-free because I was able to prep most of the dishes the night before). The entire ingredients set us back about $100, but it’s not bad considering that we were able to feed 15 people, with lots of leftovers to feed us for days! 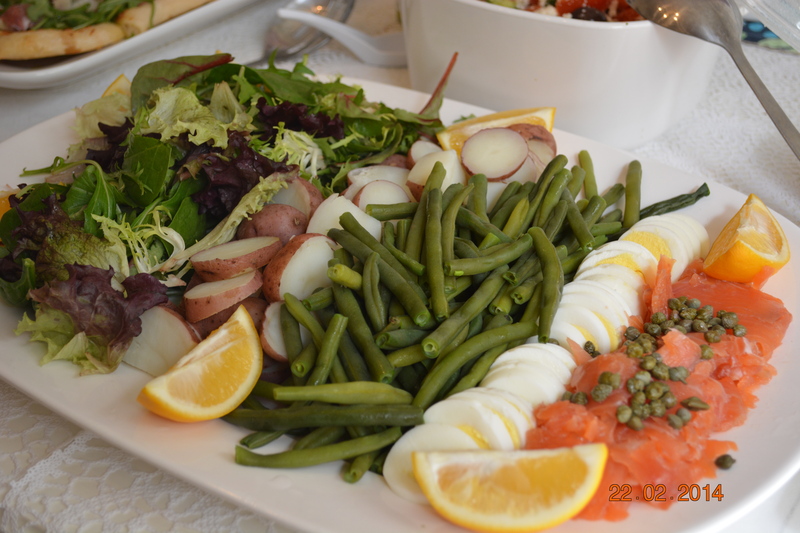 Instruction: Arrange boiled haricot vert, red potatoes (cut into halves, quarters, or even sliced, depending on the size), and eggs (sliced, preferably using a nifty egg slicer), with mix greens and smoked salmon. Decorate the platter with lemon wedges and some capers sprinkled on top of salmon. I made a simple dressing with grated garlic (more flavorful than minced), olive oil, vinegar (1:1 ratio), Dijon mustard, and salt and pepper. Put all the ingredients into a small bottle and shake vigorously. Instruction (Kevin made this pizza so I’m assuming this is how he made it but I can be wrong): Follow the instruction on the pre-made dough before proceeding (it usually asks that you leave the dough out 30 minutes before baking). Spread the dough onto a baking pan. Smear garlic-infused olive oil onto the dough and bake until the dough is golden brown. 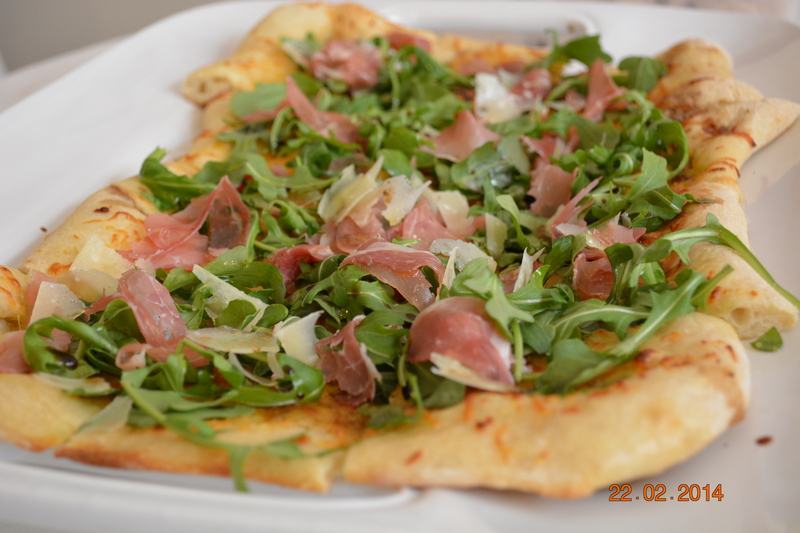 Top the pizza with handful of arugula, prosciutto slices, and shaved Parmesan cheese. Drizzle balsamic vinegar. Kevin made another pizza with pepperoni but I forgot to take pictures! Instruction: Slice a baguette loaf. 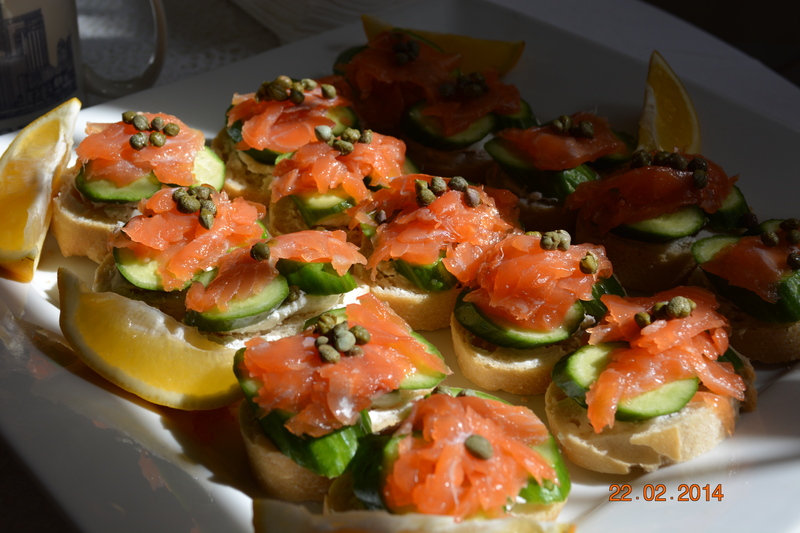 Smear a generous amount of goat cheese, and top it with sliced cucumber (two slices, if they’re small) and smoked salmon. Top each canapé with capers. I like to make these about an hour before serving to soften the baguette a bit. If you’re using crackers, serve immediately before they become soggy. Instruction: Chop tomatoes and cucumbers into small cubes and toss them into a bowl. Add minced garlic and onion, and mix them with vegetables. 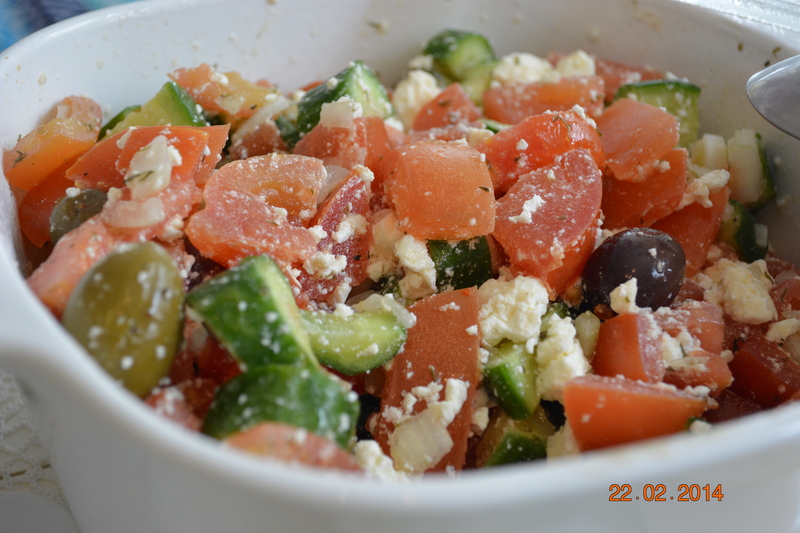 Add a crumbled feta cheese, olives (preferably pitted), olive oil, lemon juice, and salt and pepper to taste. Mix well and let it sit overnight before serving. 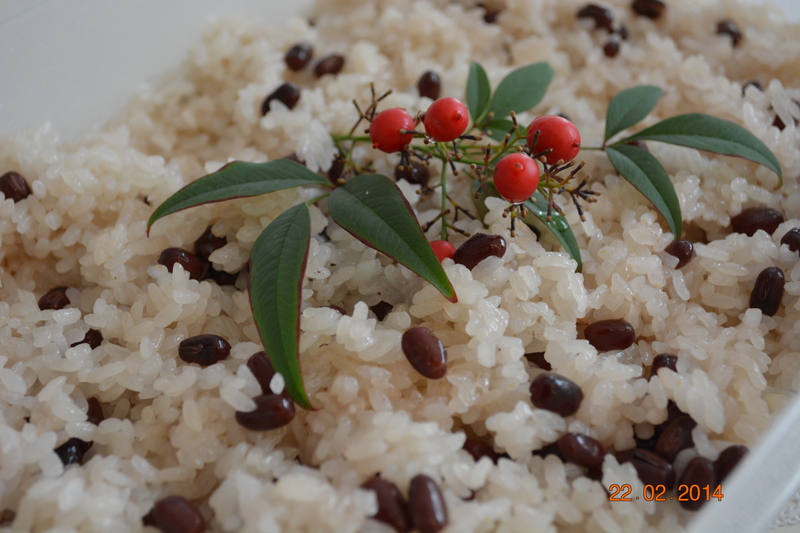 This was a courtesy of my mother, who made this auspicious Japanese “red” rice to celebrate the baby’s first birthday. We eat this on special occasions like anniversaries, graduations, and of course, birthdays! Check out this video by Cooking with Dog for instruction on how to make this rice, if you’re interested! We’re so grateful to have an amazing family (and my BFF Maya who flew from PDX to attend the party!) who spoiled us rotten with love and gifts. And we’re incredibly blessed that our baby is growing up healthy. We’re the luckiest people in the world. Thank you. This all looks so amazing. It’s coming up to our little ones first birthday and toying with the idea of party or just doing a family affair. I think the latter, as you say, she won’t remember it. You’ve definitely set the standard, I was just planning some cucumber sandwiches and crisps all round. My friend said she felt the one year mark was almost as an important milestone to her and her husband as well as their daughter, did you feel that? Hi Charlotte! Thanks for visiting! Thanks for the sweet words about the spread! I think cucumber sandwiches are lovely! I actually though about making them for the baby’s party but realized it was a lot of work! LOL. All of our menus are something I was able to prep in advance, which helped tremendously! 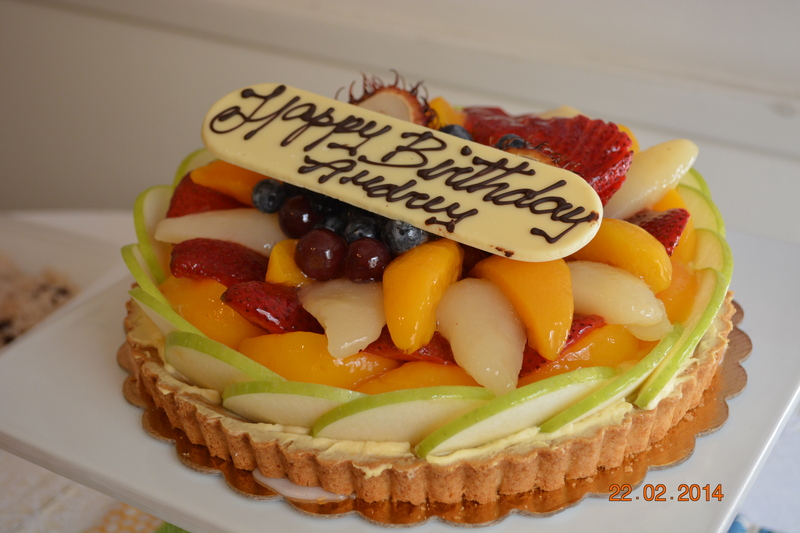 I agree with your friend that birthday #1 is something special for us parents and our family members. I think we threw the party as a way to thank the family for all the love and support (and not necessarily for the baby herself … LOL). I’m glad we kept the party small. Everyone had to hold the baby and play with her. It would have been difficult with a large group. Good luck with the party and let me know how it turns out! Your lovely Sausage Baby is so cute! And your blog is adorable!! !